We are looking for enthusiastic business partners in Scotland now! Papa John’s is one of the largest Pizza delivery franchise companies in the world, with over 4,800 stores worldwide and rapidly expanding in 40 international markets. Papa John’s tried and tested formula and an established British management team with many years experience in franchising and the pizza industry means a solid foundation for a very promising future. 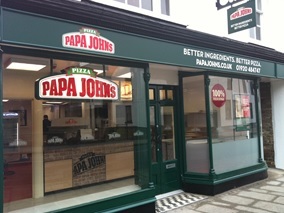 Papa John’s now have over 300 stores open and trading in the UK; working towards the goal of 600+ units. Annual worldwide sales exceed $3 billion and now Great Britain is spearheading the international expansion of the brand. Since the first UK stores opened in summer 2000, customer feedback has been excellent so much so that Papa John’s (GB) Ltd has been named UK Pizza Delivery Operator 6 times by the Pizza, Pasta and Italian Food Association. Prospects for the right people are outstanding; particularly bearing in mind that home delivery is the fastest growing sector of the market. Pizza is universally popular and unaffected by seasons or fashions. Independent research shows that in the UK, pizza consumption is expanding to similar levels as those in the United States where people eat three times as much pizza. Due to our rapid expansion, available territories are constantly changing, however we are keen to find franchisees to open stores in; Airdrie, Bearsden, Bishopbriggs, Coatbridge, Cumbernauld, Dunbarton, Dunfermline, Inverness, Musselburgh, Perth, & Stirling. You will receive four weeks initial training held both at our international training centre in Milton Keynes. This training incorporates classroom and practical work at a store local to your location. Further training courses are offered to franchisees and their team members on an ongoing basis both classroom and internet based. Extensive and continuous support from a dedicated Franchise Business Manager and our Chertsey Campus staff will assist you with recruiting and training new staff, marketing, product control, pricing and other operational areas. We are looking for individuals, couples or business partnerships with exceptional interpersonal and people skills. These are essential as you'll be dealing with customers and leading your team on a daily basis. You also need to have excellent written and verbal communication skills, and the right mindset. Our franchisees are organisers with a can-do attitude – they are people who get things done. You will need to be dedicated and passionate as well as being able to adapt to a proven way of working. We need people who are not afraid to “roll their sleeves up and get stuck in”, which means everything from making pizza through to administration. People with the right combination of drive, enthusiasm and business experience are ideal Papa John’s candidates. 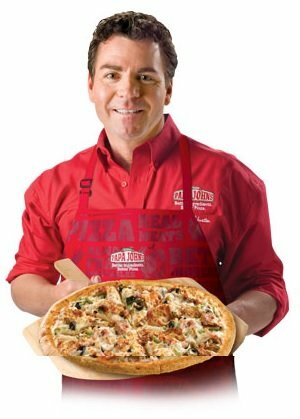 Being a Papa John’s franchisee is a challenge which calls for initiative and determination, and no small amount of dedication. But, if you have a comprehensive understanding of business it's a fantastic opportunity - one that can be personally and professionally rewarding, as well as financially. Previous Fast-food or food experience is not a pre-requisite; some of our franchisees did not have previous catering or retailing experience. The most successful franchisees are entrepreneurial, owner/operators who have excellent people skills. This may vary and depends on several factors such as site chosen and building costs but typically an investment of between £170,000 and £225,000 (excluding freehold & VAT) of which one third £70,000 should be in liquid funds. What is the franchise fee? The franchisee fee is £18,500+ VAT for each franchise unit. You will also be responsible for the rent, rates and utility costs of the store for the term of the franchise agreement. Included in the indicative total investment cost, there is also an allowance for management and staff training plus initial marketing support prior to opening your store. Most of the start-up costs are comprised of the building, fit-out and equipment costs which will vary depending on your site. The package also includes all fixtures and fittings, signage and internal marketing collateral, ovens, EPOS system and small wares as well as all agents’ fees, franchise fee, marketing, project management and pre-opening expenses.